A Bishop Ring is a space habitat similar to but much smaller than a Niven Ring. Instead of being centered around a star, it is orbiting a star or planet, thus has a much smaller diameter. It was first proposed in 1997 by Forest Bishop of the Institute of Atomic Scale Engineering. The original proposal would have it be 1000 km in radius and 500 km in width, although other proportions would be possible. 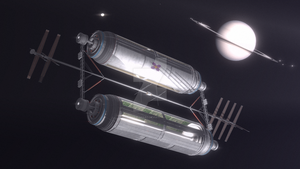 The ring would spin to produce artificial gravity using centrifugal force, and would not need to be enclosed as is the case with other spinning space habitats, as it would be large enough for the atmosphere to stick to the surface through gravity and possibly an atmospheric retention wall. By giving a tilt to its orbit, you could achieve a natural day and night cycle, or illumination could be achieved using mirrors or an artificial sun at its center. 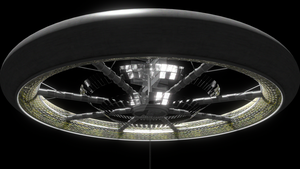 awesome, these megastructures are great!, but what happened to any future Xeelee stuff?. Halo Infinite is looking great. Daaaaaang, Halo really let itself go. Thinking of doing a banks orbital next? Well, this is sort of a thick banks orbital, so I'll likely move on instead to new structures that have different physics. The Banks Orbitals are much, much wider in diameter - a million km or so IIRC. Awesome as always. Not as grandiose as a Niven Ring or Alderson Disk, but much more practical and realistic. You should do a Birch Planet next! Apparently, it's actually quite possible to do with our universe's laws of physics! Thanks! Hadn't heard of a birch planet before, will look into it! Apparently, within our laws of physics, you can make some HUGE structures. Gotcha. Not sure if I can do this structure, as I'm trying to avoid illustrating structures that only have a single example in literature, but I'll look into it. I've long been interested in the concept of a Bishop Ring. Finding decent images of them is so difficult! Good work. A 1000km diameter ring would still have to spin with a tangential velocity of 990 meters per _second_, meaning you have to accelerate from zero relative to the whole ring to faster than the speed of a conventional bullet to match up with the surface. It would make a rotation once every two hours, roughly, and would still only have 1/10th the gravity of Earth's surface, lending little credence to retaining an atmosphere. For 1g, you're now going about half of Earth's escape velocity to match up with the ring surface. What's funny is that as ring diameter increases, tangential velocity actually goes UP for the same artificial surface gravity. It just gets even harder to actually land on, but makes the ring very handy for slinging things back out of the orbit of the parent body, which is what the sled is doubly great for. Love stuff like this, and yes I recall seeing it back in '97 but I was doing similar stuff in sci-fi form in the mid-eighties. One of these structures was two thousand kilometers across and about the same distance out from the planet it orbited as the moon is for reasons of gravitation. That particular project was called topsoil. Anyway, this is a terrific piece of art you have there. Thanks Jonathan. The banks orbital was discussed 10 years earlier than the bishop ring, and of course the much larger ringworld was in 1970, so ya, there's a lot history of ring shaped habitats going back 50 years. I was personally very inspired by the space habitat artwork of the 1970s from NASA. Ahh, very Isaak Arthur -esque! reminds me of the youtube channle Isaac Arthur. Yes, I'm really glad people like Isaac are helping to bring more science to these sorts of subjects, and bringing them back into the public eye.